Whether you call it home automation, connected home, or (cringe) internet of things, automated homes are becoming increasingly prevalent, and will soon become the norm as major players like Apple, Google, Amazon, and Samsung enter the market. Although home automation standards and products are still in flux, a dedicated Uninterruptible Power Supply (UPS) should be considered an important part of any system set-up, and is a fairly future proof. The UPS has been around for decades and is unlikely to become a casualty of the home automation standards battle. 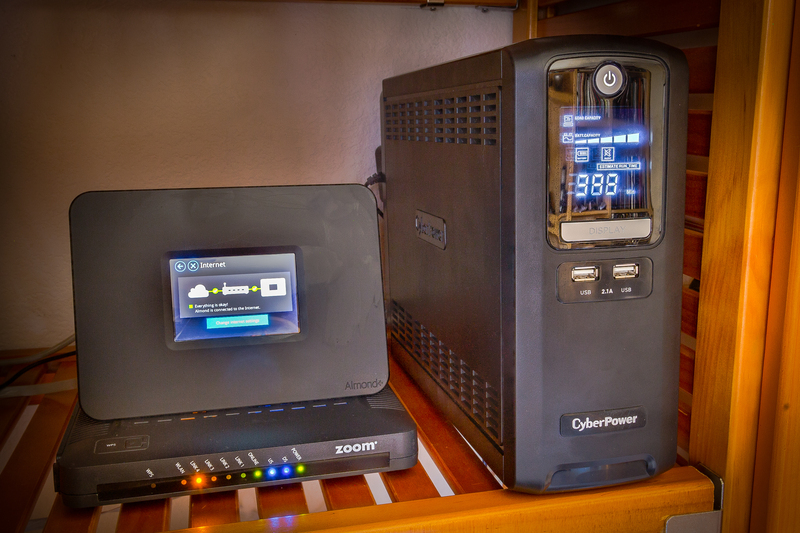 It is not uncommon to see well equipped connected homes without a dedicated power backup capability, and yet the reasons for including a UPS are precisely the reasons to automate the home in the first place: security, safety, and convenience. With a UPS as part of your system, if your home loses power due to a utility issue or malicious intent, you can still maintain security alarms for doors, windows, motion detection as well as lock status and control. If disaster strikes and you lose power due to fire or flood, you are still able to receive those smoke or water sensor alerts. Disaster protection: The First Alert Z-Wave smoke detector, Everspring Z-Wave water/flood sensor and a UPS. Even if your home automation controller already comes complete with its own battery backup, as with the new SmartThings V2 Hub, a UPS can greatly extend its duration (see the controller feature comparison table). Having your cable modem, wireless router, and home automation controller connected to a dedicated UPS allows you to receive important notifications locally and – assuming your internet provider maintains power – remotely as well. A UPS can also ensure several hours of continued connectivity to all of your battery-powered devices, including both home automation sensors as well as personal devices such as cell phones, tablets, and laptops. I am surprised at the lack of available Z-Wave or Zigbee power failure detection devices. Hopefully these will become more standard over time. If I’m away from home, I would like to be notified immediately if there is a power failure, so that I can check in on pets, monitor the house security system, or open a door lock to allow a neighbor to check up on things. A monitoring and notification capability could be scripted by monitoring status of your UPS or ping status from non UPS protected plug-in devices, but this is certainly not as convenient as a dedicated device would be. I recently purchased a 1350 VA, 810 Watt Model CST135XLU CyberPower UPS for under $100 at a local Costco, and am impressed with the capabilities for the price. This UPS is Energy Star qualified and outputs an adaptive / pure sine wave. The features of this retail model appear similar to the more commercially available CP1350PFCLCD. Costco has this unit at more than a 25% discount over where I believe this model would fall in the price to capability range of other CyberPower UPS systems available from on-line retailers. As an added bonus, this UPS comes with two USB ports – perfect for an emergency charge of a cell phone if needed during a power outage. For our test set up, I placed a cable modem, Almond+ (combination router and home automation controller), cordless phone hub, and a (highly recommended) Ooma Phone System on a dedicated UPS. I have not verified the accuracy of the estimate, but the UPS display indicates that these four devices should last over 6 hours on UPS power alone. 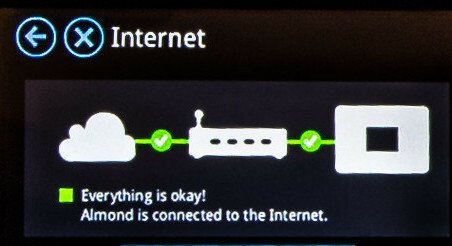 If I weren’t concerned about home phone use during a power outage, the UPS indicates that the Almond+ and Cable modem will last over 10 hours on UPS power.